Want to change up your look but not sure how? Well, you’ve come to the right place. Accessories are key to a quick change of looks, and one of our fave hair accessories is the bandana — there is just so much that you can do with this simple piece of fabric. 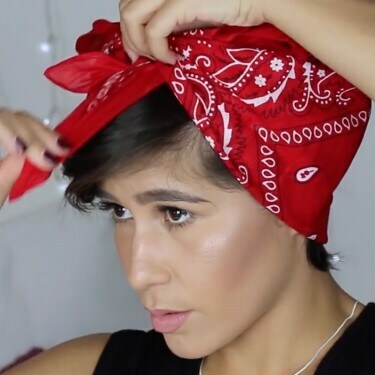 Here are 5 ways you can wear you bandana. Step 1: The prep step is an important one because smooth, shiny hair always looks best with any accessory. For the best results we’d recommend you use the TRESemmé Keratin Smooth Shampoo and Conditioner. Before you begin styling with the bandana, if you want some added volume and texture to your hair, we recommend curling it slightly. Step 2: Part your hair into a centre part or a slight off-centre part. Avoid parting your hair in a deep side part. Next, take a front piece of hair and separate it from the rest of your hair. Step 3: Fold your bandana in half so it forms a triangle, and fold it twice lengthwise so it looks like a long rectangle. Once you have that down, place centre of the bandana on the nape of your neck and bring the ends towards the top of your head. Ensure both ends are the same length. Step 4: Tie the bandana into a knot, and be careful not to get the front piece mixed in with the rest of your hair. When you tie your knot, tie it twice, and on the second time, twist it around so it makes a little bunny ear shape. Step 5: For a long-lasting hold and extra texture, use the TRESemmé Extra Hold Mousse. Pump it into your hands and apply to the back or your hair by scrunching your hair with your hands. This gives your hair that messy, textured look. Step 1: Part your hair in the centre or slightly off-centre. As with the first look, avoid a side parting. Step 2: Fold your bandana the same way as the first look, and place the centre on your forehead. Take the ends around your head and tie a simple knot. Step 3: Apply TRESemmé Extra Hold Mousse to the top of your hair to give your hair extra texture and a messy look, and you’re done. Apply it by scrunching your hair with your hands. Step 1: Part your hair in a deep side part. Pull the hair on one side of the part towards the back and hold it down and push it forward a bit to make a pouffe. When the desired height is reached, pin it with a bobby pin. Step 2: Take your bandana (folded the same as the first two looks) and place the centre at the nape of your neck. Bring the ends of the bandana around to the front. Ensure that the lengths are even. Step 3: Tie the ends of the bandana into a knot just behind the pouffe. Tie the knot twice, and twist it around on the second knot so you get a nice bunny-ears effect. Step 5: Pump a small amount of TRESemmé Extra Hold Mousse into your hands and scrunch it into the back of your hair with your hands. This gives your hairstyle a long-lasting hold and a messy, textured look. Step 1: Fold your bandana in half so it is in a triangle shape. Place the centre of the long side of the triangle against the nape of your neck. Bring the two side ends towards the front, with the middle end lying on top of your head. Step 2: Tie the side ends of the bandana on the top of your head, and tuck the middle end underneath the knot. Your can tuck your hair in the bandana or leave a bit sticking out, whatever you prefer. Step 3: Make sure the bandana is secure on your head and tuck in the bits that are sticking out. Tuck the middle end of the bandana underneath the knot. Step 1: Fold your bandana in half so it is in a triangle shape. Place the centre of the long side of the triangle across you forehead and tie the two side ends at the back of your head. Step 2: Tuck the middle piece under the knot, and then tuck in any other sections of the bandana that are sticking out.